Mayor David Condon promoted Craig Meidl to chief from within the Spokane Police Department in the wake of the Frank Straub scandal. 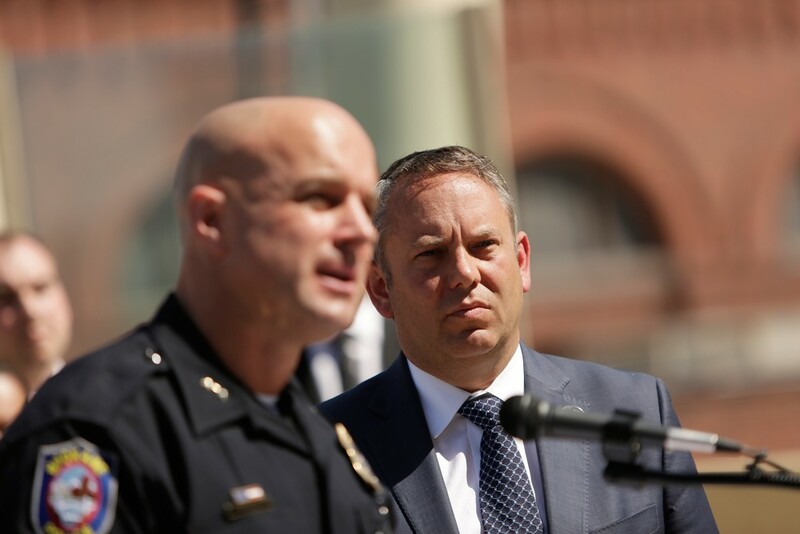 Spokane Mayor David Condon rebuffed the media's portrayal of former police chief FRANK STRAUB as his "hand-picked" choice for the job. This time around, there would be no mistaking. Condon hired an outside recruiting firm and assembled a selection committee of nine city leaders and community members to help whittle down the original list of 31 candidates. He assembled four interview panels, totaling more than 40 people. When one of the candidates dropped out, City Council President Ben Stuckart voiced concern, pushing for Condon to bring at least one more candidate to the table. That's about when things began to unravel, and in the wake of an independent investigator's report that identified a toxic internal police culture and found evidence that Condon's administration misled the public leading up to his re-election, Spokane's mayor landed on a new chief — Assistant Chief Craig Meidl. In doing so, Condon discarded the two candidates identified by the outside firm, opting to promote Meidl despite the fact that he did not apply for the job, and before this week's decision said he did not want the job. Meidl, who has been with SPD for 22 years, was one of the officers who saluted former Officer Karl Thompson after he was convicted in the 2006 death of developmentally disabled janitor Otto Zehm. "Personally, I'm really surprised at the mayor's decision," says SPD Lt. Dave McCabe, president of the Lieutenants and Captains Association. "I think process is important, and anytime we deviate, it ends up getting us into trouble. I have no problem with Craig putting himself in for chief, but up until yesterday he told everybody he didn't want the job. And the mayor didn't think that he was good enough to be named interim chief at any point in the last year." Condon also announced earlier this week that he does not intend to immediately seek approval from the city council, as required by city law. "The mayor doesn't want to follow the law. He'll follow it, but later," Stuckart scoffs, noting that Condon could theoretically delay confirmation for three years. In an email, city spokesman Brian Coddington explained that Condon wanted to give Meidl a chance to show his leadership skills before asking council approval. When Washington Supreme Court Chief Justice Barbara Madsen wrote an opinion last fall that funding CHARTER SCHOOLS like public schools is unconstitutional, the state's wealthiest philanthropists took notice. The Bill and Melinda Gates Foundation and other wealthy charter-school proponents have spent millions in the effort to allow charter schools in the state. They then spent millions more in a campaign for a legislative fix that would allow charter schools to continue to exist, even after the Supreme Court ruled them unconstitutional. And now that the state's largest teachers union has promised to challenge that fix in court, more money is pouring into the campaign of Greg Zempel, a Kittitas County prosecutor who will try to unseat Madsen on the state Supreme Court in November. Zempel has criticized the court's decision against charter schools. The political arm of Stand for Children, a nonprofit education advocacy organization, spent $130,000 in independent expenditures supporting Zempel as of Aug. 1. The organization's main funding this year reportedly has come from Connie Ballmer, former Microsoft CEO Steve Ballmer's wife; Reed Hastings, founder and CEO of Netflix; and Vulcan Inc., owned by Microsoft co-founder Paul Allen.